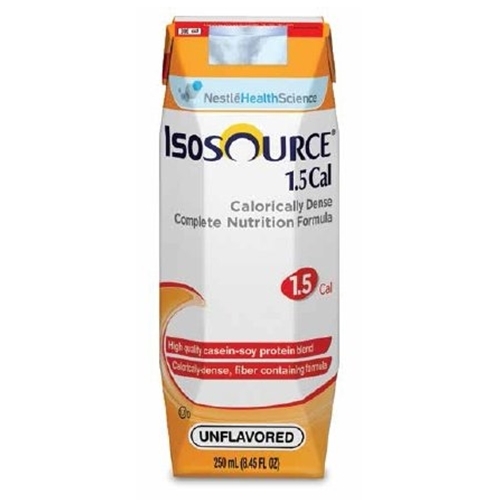 Isosource 1.5 Cal Formula from HealthyKin.com provides extra calories and protein to meet nutritional needs and fiber to help support digestive health and normal bowel function. Quick shipping. easy to navigate website, found what I needed right away. If I'm still using PEG tube, when I run out of product, I will order from this site again. I’m able to eat solid food better, but I still depend on Isospurcr when I’m in a hurry. It’s nutritional and portable. I've been dealing with another company & was very disappointed in their service, so I went online to search for another company to supply my food. I was so pleased that the website was easy to use & the product was shipped quickly. Although the price is slightly higher than my other provider, the service is well worth it! First time ordering from Healthy Kin. Great price, fast delivery. Healthy Kin is now the only company I'll use for IsoSource. Excellent service from Healthy Kin!!! Isosource in the individual cartons and Boost Plus have been the bulk of my diet for almost two years. The delivery is quick, and the product always arrives intact.